Barb Jungr is an acclaimed composer, songwriter and performer whose latest album, From Stockport to Memphis, was released in 2012. She has recently written the music for an adaptation of Michael Rosen's We're Going on a Bear Hunt for the Little Angel Theatre. Jungr is herself a shining exemplar of genre-blindness. Her career has taken in everything from jazz singing to film acting to radio presenting to theatre writing; she has busked on Portobello Road, paid her dues among New York’s cabarati, and flogged her wares at the Edinburgh Fringe. It clearly takes great effort to be so versatile and unsnobby. “We schlepped,” she admits frankly. “But people are extraordinary and resourceful.” More recently, she has begun experimenting with puppet theatre, and when we meet for lunch in Islington, she is in the thick of rehearsing for the upcoming Little Angel Theatre production of Michael Rosen’s We’re Going on a Bear Hunt, a co-adaptation for which she has written original music and lyrics. We’re Going on a Bear Hunt at the Little Angel Theatre. Jungr admits there is a certain “curious resonance” for her when it comes to puppetry, having grown up in a house full of puppets. This early exposure (along with her unusual name) is down to the fact her father is Czech, and that Czechoslovakia is the land of marionette theatre. She discusses puppeteers with a sense of awe and wonder about the magic of the process, however when she talks about the use of puppetry as a theatrical device, she is astute, almost academic. “It’s very filmic. You can play with scale.” Rather than viewing it as a reduction in size from human performance, she sees it as an increase. It’s far easier to be convinced that a tiny well-manoeuvred puppet is life-sized, than it is to build a colossal performance space. Moreover, the possibility for suggestion is far greater, and peculiarly magical. No wonder Jungr’s enjoyed so many fruitful collaborations, when she exhibits such willingness to meet people over halfway. She maintains it’s not a natural state of mind for her, but one that she works to adopt. “I probably have the urge to be controlling, but I’ve learned it’s pointless… If you always work with people who are better than you, why would you want to control that?” Having spent an hour in her company, I imagine she’s very tenacious and forthright with her opinions, and far from a pushover, but she appears to be far more interested in gathering the extraordinary talents of others, than imposing her own on to them. One of her most endearing qualities is that she really has to be forced to talk about herself, and even then it’s with an invigorating dose of Rochdale-raised self-effacement. On the subject of We’re Going on a Bear Hunt, she can’t say enough. Bear Hunt was itself a collaboration of sorts, a beautiful marriage of words and pictures. 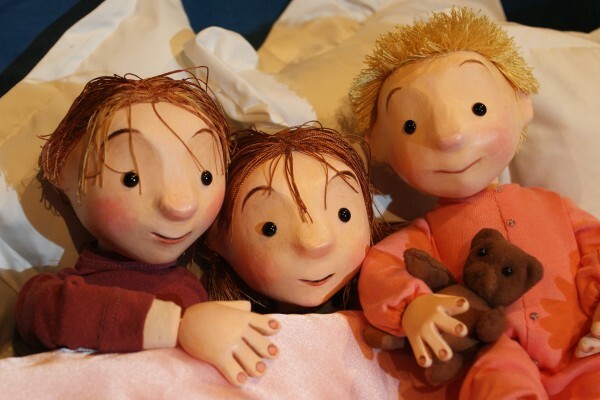 Jungr and her Little Angel Theatre colleagues reportedly found inspiration in Helen Oxenbury’s illustrations as much as in Michael Rosen’s text, describing them as “beautifully elegiac and dreamlike.” Rosen has been quoted as saying he credits Oxenbury with great inventiveness, and admires the book almost as an outsider. It’s the perfect source material for an artist as collaborative as Barb Jungr, surrounded by a team of equally willing associates. As she says herself, proudly, “99.9% of the time, the people I work with are bloody brilliant.” I’m not surprised. Great minds often think alike.